Just off the top of your head, how many bands can you name who have almost 20 studio albums under their belt and are alive and kicking today, with two of the original members still around? Personally, I ran out of bands way before I ran out of fingers. 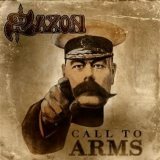 However, British metallers Saxon are back with their 19th album Call To Arms to buck the trend. Hard to believe these guys have been making records since 1976, which is longer than I've been alive. And just to spoil the review for those who like to get the punchline early: it's a great album, go buy it! The uptempo Hammer Of The Gods jumps right in with a very classic metal-sounding riff, and as Biff Byford lets loose with his unique, strong voice, you know everything is going to be okay -- another solid 45 minutes of Saxon greatness is about to occur. Think of a good aged liquor, and you've got Biff's vocals, which still sound great after all these years. He's even got a bit of howl left in him, if not all the control he used to have. Back in '79 sets up a great traditional slow riff, and while the album features the title track with and without orchestration, the orchestrated version is miles better. The chorus alone is just spectacular, combined with layers of strings and choirs, and brings a great epic flair to what could have been just a decent power ballad. Another standout is Afterburner, which lives up to its name with some great thundering doublebass attack from Nigel Glockler. As with all the tracks, the guitarwork is just fantastic, with riffs galore, solos with glitter on them, and yet more power chord riffing. When Doomsday Comes opens with yet another catchy hook, and ends with an odd keyboard effect, while the midpaced, anthemic No Rest For The Wicked opens with a vocal effect -- here is a band that experiments on a very small detail scale, while keeping their sound and approach very solidly planted. All this without ever sounding repetitive, either, a feat that many other musical groups seem to struggle with. The mix is a bit wet, but that simply keeps the sound from straying into dated territory, and the combination of topnotch production values with a traditional heavy metal sound makes for some enjoyable driving music. As usual, blues-inspired playing enhances songs like Chasing The Bullet, almost giving a Southern rock vibe. One other noticeable element is the bass guitar, which is placed very prominently here. All in all, this is yet another example of an album that really doesn't have any bad tracks or low points. It stands as an obvious point that such veterans of the trade keep bringing consistently solid work to the table. A great many bands today could learn a thing or two (or, in some cases, everything) from Saxon, who show that they are still on top of their BWOHM game. Call To Arms is a very good album, easily standing with their last several offerings, and a worthy addition to any heavy metal collection. Here's hoping they keep up the great work!